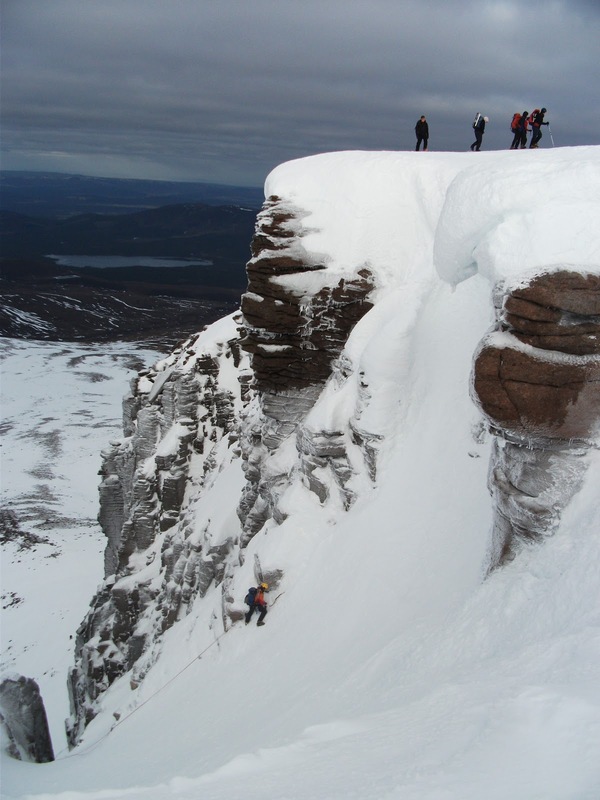 I am working at Glenmore Lodge this week on a 5 day Introduction to Winter Skills. Today my group and I after a chat about kit and what we all wanted to get out of the week headed into Coire Laogh Mor to try and escape the stong south westerly winds that were blowing. This ploy I am glad to say worked very well. Spent the morning looking at boot work and axe work in the shelter of the corie before heading up and over the ridge (were it was windy) and down into the ciste gully. Here there was some excellent snow for introducing some ice axe arrests before heading back down to the bus. It looks like it is going to be a blowy week with gusts of 90mph being predicted on the plateau for Wednesday! For day 2 of Jen, Swatee and Harry's winter skills course we headed up towards the Cas Headwall. The weather was stunning in that the cloud level was high and the sun was out but it was fairly windy! We got most of the way into the cas looking at some more cramponing skills and introducing avalanche assessment but unfortunately Swatee's ankle was sore after going over it yesterday. We decided from here to head back down through the ski area and back to the van for a spot of lunch at the Glenmore Cafe. After this we headed out to look at some navigation in the woods around Glenmore Lodge. A shame about Swatee's ankle but a great weekend all the same. I was out today with Jen, Swatee and Harry for an introduction to winter skills. We headed into Sneachda along the side of the fiacaill looking at boot work, crampon work and ice axe work. The cloud was down at the start of the the day but lifted as we made it into the base of the corrie. Busy, busy, busy is the only was I can describe the climbs between Aladdin's and the Goat Track there were people on all the routes and at one stage I counted 15 people in Goat Track Gully! That said the Mess of Pottage and Fiacaill Buttress were quite! Good hard conditions under foot and the climbing looked excellent as well. After a session on the flat ice we traversed around to underneath Windy Gap and did some ice axe arrests before heading back to the van. 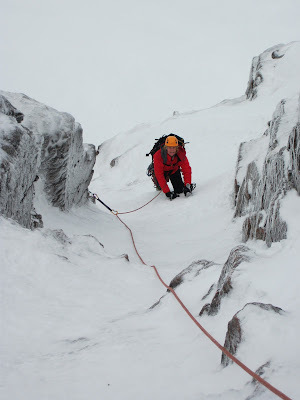 Just had an e-mail with some photos from Mike who did Deep Cut Chimney on Hell's Lum last Sunday. He reports good conditions with things being nice and frozen and no wind on the crag. It was a little different on the top with white out and blizzards to help them on there way home. The crux was as ever good thrutchy climbing! Moshe and I headed into Sneachda this morning in what was a breeze but nice and cold morning. All the old soft snow had re-frozen and the fresh snow that had fallen over night had been dumped on the south facing slopes by the northly winds. The corrie was not too busy with teams heading to most of the usual gullies. We chose Central Left as our route for the day, with the aim to take in as much of the rocky rib section as possible to push the grade closer to II rather I. The approach slopes were solid and hard work on the calf's but once on the route there was some great neve to climb on and some useful ice in places as well. Many of the cracks were chocked with ice but the belays were excellent and we had the route to ourselves, apart from one pair who decided to move together and then just traverse in above us, needless to say I was not impressed. The little ice pitch at the top of the routes was formed well although thinner than I was expecting. Once at the top it was a few navigation legs to get us back to 1141 safely as visibility was about 40m. A great day out and Moshe did really well for his first climb summer or winter. Tuesday - Damp and Windy! I was out for the first of two days with Moshe today. After a coffee and chat about kit in Aviemore we headed up to what looked like a fairly damp car park! We headed up through the ski area (still some brave skiers out!) and in towards the Cas head wall, here we re caped boot and crampon skills as well as looking at some ice axe arrests. From here we headed up to spot height 1141m and on towards windy gap. It was still soft underfoot here and with little visibility so we headed down into Coire an t Sneachda. From here we traversed around the base of the crags towards the rescue box and then up towards the goat track were we looked at snow avalanche assessments and then had a play on the flat ice and some of the little ice bulges that were still in place. 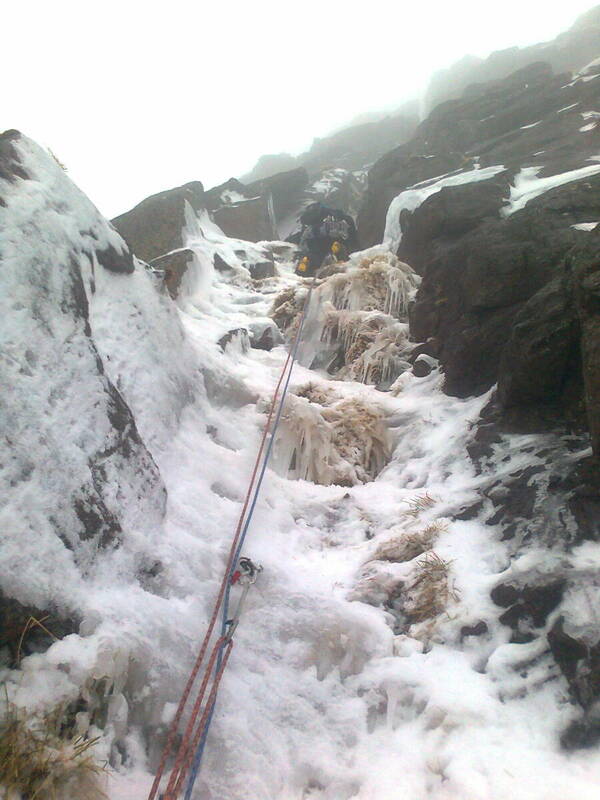 Everything was dripping and soft but there were still a fair few teams out climbing! Looks like it is going to be colder tomorrow. I spent the weekend down in the Loch Tay area with King Edward school from Sheffield. On Saturday we headed down Glen Lyon and headed up Stuchd an Lochain from the dam at the end of Loch an Daimh. Although the snow line was quite high it only took us about 50mins before the students were learning lots of new winter movement skills. They started off learning about using the boot as a tool and then progressed further up the mountain were crampons and ice axe were introduced. There was some excellent flat ice as well as steep snow to practice on. New skills acquired we headed up to Sron Chona Choirein and then decided as time was a little short to forgo the Munro top and drop into the north facing bowl to look at some ice axe arrests on some hard neve! We then dropped down via Lochan nan Cat to the loch edge and headed east back to the bus. All the ground was frozen solid as well as the loch which provided the boys in the group with the chance to see how easy it was to break 5cm thick ice, thankfully non were silly enough to stand on the frozen loch! It was difficult terrain along the side of the loch and so was dark by the time we returned to the bus but everyone had had a great day. After that it was a quick drive past the Ben Lawers visitors centre in search of a snow drift for Sunday. There was a brief moment of concern when it was thought that a wolf was spotted from the minibus but thankfully it turned out only to be a friendly dog! We had planned Sunday as a emergency snow shelter day but with a high snowline and the KES team having to do the long drive back to Sheffield it was decided to use the area north of Schiehallion for some navigation practice before jumping back in the bus and heading south around midday. A great weekend and I am looking forward to March already when we have a bothy trip planned together. Thanks to Mike, Chrispin, Andy and all the KES Pupils for a great weekend. Steve and Caroline were out in Coire an Lochain on Saturday and climbed Ventilator. They reported excellent neve with reasonable gear, no cornice issues and awesome weather! The Vent and Milkyway had many parties on them but they had Ventilator to themselves. Thanks for the photos guys. Stunning is the only work that could be used for today! The aim was to have a journey to put into practice Hanna's new skills learnt over the previous days. We had been joined by Andy as our photographer today as Tom was on Braeriach for the day. We left one car at the sugar bowl car park and then headed up to the ski centre. From here we headed out toward Coire an Lochain and up to spot height 1083m looking at navigation and just generally enjoying the awesome views and weather. From spot height 1083m we had great views south along the Lairig Ghru as can be seen in the photo above. After taking lots of photos we headed north to Creag an Leth-Choin (Lurcher's) then descending down hard neve slopes to the Chalamain Gap and back out to the Sugar Bowl car park. It really was a stunning day and a great way for Hanna to finish her trip to Scotland. A great 3 days out in good conditions and fun company. Looking forward to seeing the feature in the Trail Magazine now! I am off down to the Loch Tay area this afternoon for the weekend with King Edwards School from Sheffield, then back in the Cairngorms next week. Day 2 of Hanna's winter skills course had us packing at the ski car park and heading up the Cas Fiacaill towards the Cas headwall. Again the neve was solid today and we had crampons on from about 100m from the car! We headed up the fiacaill chatting about various avalanche assessment ideas and indicators but not really expecting to see much as the snow was so stable. So I was please to find some windslab on the east facing aspect of the Cas Headwall and although it was stable it allowed us to look at hasty pits, hand sheers, trenching and assessing layers using our axe shaft. We then had a look at some steep snow movement skills like front pointing and choking the axe before getting back onto the ridge and heading to spot height 1141m. From here the cloud started to lift and we did some navigation across Coire Raibeirt and up onto Cairngorm were got some stunning view south. From here we dropped down to Ciste Meredith were we could look at some more steep snow movement skills in both ascent and descent as well as having a look in some snow holes that had been slept in the night before. Hanna then lead us on a few more navigation legs back down through the ski area and to the car. Another great day. I was out today with Hanna and Tom from Trail magazine for Hanna's first day of winter skills. We parked at the Ciste car park and headed into Coire Laogh Mor. It was clear but a little breeze as we headed into the corries, however we were on hard neve from almost the car park level. On the way in we looked at kicking steps using our boots in ascent, decent and sideways. 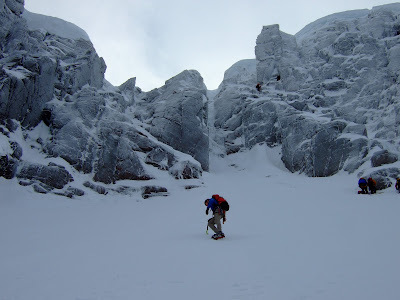 Once the terrain steepened up we introduced the ice axe and looked at cutting slice steps in ascent and decent as well as cutting master blaster steps in ascent. Using the steep slope to the side of the main corrie we then put crampons on and headed up to the plateau before heading across to spot height 1028 which gave us good views down into Strath Neathy and El Alamein Bothy. The wind had picked up on the top as we headed back across towards Ciste Gully were we dropped down and found a nice east facing slope to look at some ice axe arrests before heading back to the car. A great day out although no photos today, I was feeling a little camera self conscious with a pro photographer with us all day! I was back in the Cairngorms today working for Pete Hill on a Winter Mountain Leader ropework day. The forecast was not great and as we headed into Sneachda we were being blown around a fair bit, I was hopeful that we could tuck in under the crags and get out of the SW winds. Thankfully the plan worked! We looked at the main snow belays today bucket seats, horizontal axes, snow bollards, stompers and ways of improving them all plus of course testing them to destruction. We also spent some time discussing managing a group through steep ground and when you might have to use a rope. The to finish off the day we had a look at confidence roping. The weather during the day was warm, windy with showers which could not make up there mind if they were snow or rain! Still plenty of snow in the corrie but really only the easier gully lines in condition. There were teams on Hidden Chimney, Aladdin's Colouir, Central Gully, The Runnel and I think a team heading towards Goat Track Gully. The cornices are still there and sagging a lot, I would not go anywhere near them until it all re freezes. Day off tomorrow (have to get the van sorted, engine is making strange nosies!) then back to the Cairngorms for 3 days so will report back on conditions. I was at Glenmore Lodge today. The days was their winter induction day for instructors working for them over the winter. We spent an hour or so in the morning discussing various courses and resources in the centre before heading up the hill and into Coire an t-Sneachda. We spent some time discussing venues their pros and cons and some issues that have come up in the past plus some emergency procedures. We then had a look in the rescue box that was unfortunately full of water, so we emptied the kit bailed out the water, put the dry kit back in and took the wet kit back down the hill to be dried and sorted. The coire was busy with people doing skills and some climbing. There were teams on Goat Track Gully, Mirror Direct (which is hanging in their but damp), Patey's Route (was looking thin) and Aladdin's Couloir. Everything was thawing but there has not been that much snow loss although that could all change tomorrow if the heavy rains that are forecast arrive. 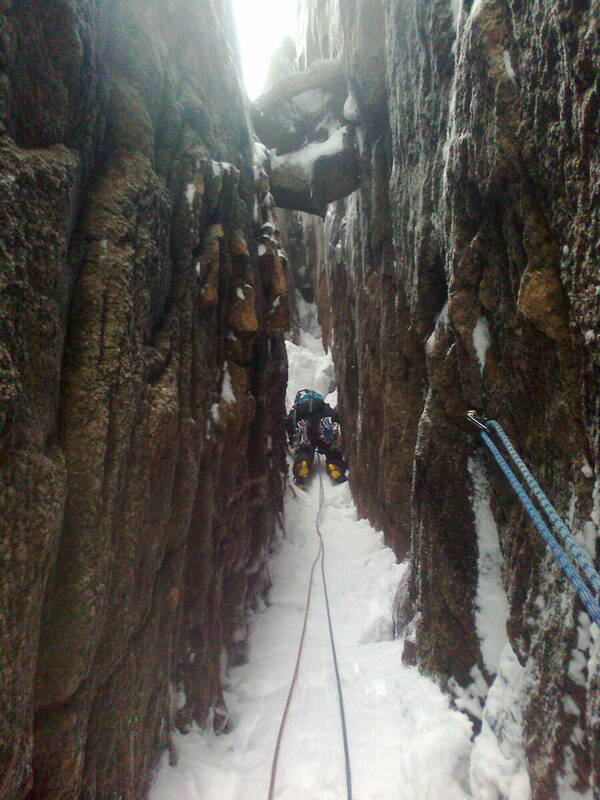 The buttress routes are black but if we get a re freeze soon the neve in the easier gullies will be excellent. Keep those fingers crossed! An interesting and yet very sobering look at the Heuristic traps of avalanche assessment. It takes a while to buffer the video but is well worth the effort. I was meant to be skiing with Andy today but he decided the weather did not look great and stayed on the west. So I went for a slide at Cairngorm on my own. The snow cover at present is excellent and the although the vis at the start of the day was poor it soon cleared up to leave great views, light winds and minus 5 at 900m. Most of the runs are in really good shape at present and the slopes were quiet. I would recommend a ski tomorrow before it looks like a big thaw is on the way. The video footage below is of a run down the M2 from the top to almost the car park, before my hand got too cold! It was not as windy as it sounds! I spent the weekend with Mark, Hannah and Stuart on a winter skills course in the Cairngorms. With the aim of making them self reliant winter walkers by the end of the weekend we had much to cover. On Saturday we headed into Coire an t' Sneachda and did a loop around the corrie looking at boots skills, ice axe arrests, crampons skills and snow analysis. On Sunday the plan was to go for a longer journey to practice these new skills plus look at more avalanche assessment and some navigation. We headed out to spot height 1141 stopping a few times to look at snow profiles on the Cas headwall area which was filling in quickly. We then headed up and over Cairngorm in zero visibility and navigated our was down to Ciste Mhearad. Here we looked at some more movement skills on steeper snow plus some more avalanche assessment. We then navigated our way back down An t-Aonach to the car park. All in all a great weekend with good conditions and great company. The ski centre was not as busy as I was expecting for the weekend but Sneachda was very busy. Good conditions in the gullies with all the regulars being done. Fiacaill Buttress was quiet (due to the approach slopes) but all the other crags were busy. Patches of windslad seemed to be on all aspects and we saw the odd small avalanche. All change today with more snow coming in and strong winds moving it around the SAIS forecast makes for sobering reading! Hopefully out tomorrow on the planks with Andy. 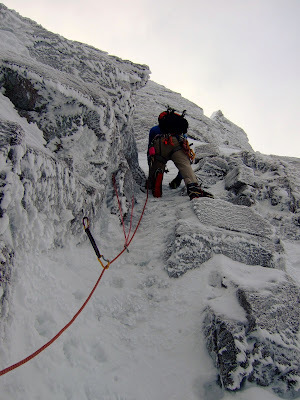 I was working across on the west last weekend for the Mountaineering Council of Scotland. There were two 1 day Avalanche Assessment courses based out of the Nevis Range open to both members and non members at £35 per person and run on a 1:4 ratio these are great value. The snow pack was fairly solid having re-frozen after the post Christmas thaw but there were still plenty of layers to assess on both days. On both days I took my teams around the Nid area were there is plenty of different aspects, little bowls, terrain traps and different angles. We spent the days looking at assessment techniques, safe route choice as well as throwing in some winter skills along the way. A great few days and a nice way to see the New Year in! I am in the Cairngorms this weekend and next week doing a mixture of winter skills and climbing. The skiing is good at present with another 10cm last night. Great start to the year.